The neighborhood was already covered with graffiti. Tough students had driven prospective community center directors out of town. The teens were heading for dead-end lives. Judith Baca took them off the streets, out of her classrooms, and away from their gangs, and brought them together to express themselves through art on a grand scale. Baca’s answer was painting murals. Painting together made turf wars, racial differences, sexism, and segregation fade away. They worked together peacefully. Their murals covered entire walls on buildings and told stories about their communities, preserved their history, gave them a voice, and promoted acceptance of differences between cultural groups. Baca saw the bigger picture—bringing peace and harmony to a troubled world through a mural movement would also preserve the generations-old, rich tradition of Mexican muralists. Born to immigrant parents, Baca never knew her musician father, but she thrived in her matriarchal household and had a deep connection to her grandmother. She had a strong sense of both American history and her Latino roots. She did not speak English when she started school, but a teacher allowed her to work on art during lessons. When she attended California State University at Northridge, she felt isolated from any sense of her own culture. She missed her family; there were only a handful of Latinos and African Americans, and the art she studied was of European influence. When her grandmother asked her to explain her abstract work, Baca looked deep within herself to analyze what she was doing and why. She realized that having her art exhibited in galleries was not as important as having artwork that was accessible and stirred reaction. She wanted her art to be real and speak to people like her grandmother. 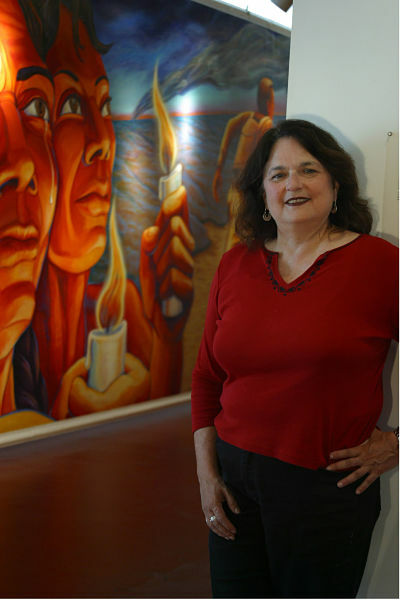 After earning her bachelor’s and master’s degrees in art, she went to Mexico to study the great muralists Diego Rivera, José Clemente Orozco, and David Siqueiros. Their work moved Baca, and she realized that was the type of artwork she was meant to do. She returned to the United States ready to teach mural painting at her old high school, but she was fired for taking part in peace marches protesting the United States’ participation in the Vietnam War. In 1974, Baca was appointed director of the City of Los Angeles Citywide Mural Project. She worked as a roving teacher, going from schools to parks to get kids to paint. She started her own group, Las Vistas Nuevas, made up of twenty teens from four different gangs and neighborhood groups and expanded the mural project to the entire city of Los Angeles. After securing financial backing, more than 1,000 people created more than 250 murals. Among her best-known works are La Memoria de Nuestra Tierra, located in the Denver Airport, and Female Dragon in the Interior Library of the California Institute for Women. The half-mile-long Great Wall of Los Angeles is the most acclaimed mural. Created over five summers, more than 400 youths, artists, and historians produced a historical timeline mural with information on ethnic groups and women not normally taught in public schools. It chronicles the history of California with images of Chumash Indian life and culture, farm union organizers, black activists fighting for equal housing, and the plight of Japanese Americans during World War II and on through the 1950s. In 1976 Baca founded the Social and Public Art Resource Center (SPARC), a nonprofit public art program. She also developed the Great Walls Unlimited: Neighborhood Pride Program, to create murals in nearly every ethnic neighborhood in Los Angeles. In 1987 she began her largest mural project, the World Wall: A Vision of the Future Without Fear, to promote the theme of peace and cooperation among cultural groups from around the world. The portable mural, painted on moveable panels for easier transportation, traveled to seven countries where artists painted their own visions of peace.